The Parliamentary Delegation at the Pacific Leadership and Governance Precinct. 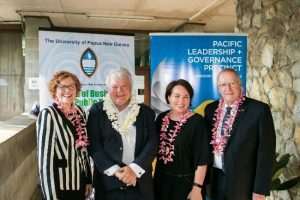 A Parliamentary Delegation from Australia visited the Pacific Leadership and Governance Precinct in Port Moresby on Monday 6 November, as part of their official visit to Papua New Guinea. The delegation, which included Senator the Hon Ian Macdonald, Ken O’Dowd MP, Cathy O’Toole MP, Senator Kimberley Kitching and Julia Agostino, met representatives from the Precinct’s core partner institutions, including the University of Papua New Guinea (UPNG), the Department of Personnel Management, the Papua New Guinea Institute of Public Administration and the Australian National University (ANU). UPNG hosted a roundtable discussion which provided partners with the opportunity to talk to the delegation about the impact of the Precinct. Dr Manoj Pandey (left), Australian National University economics lecturer seconded at the University of Papua New Guinea, and Methuselah Wabiria (right), fourth year economics student, explain the impact of the Precinct partnership with UPNG’s School of Business and Public Policy. 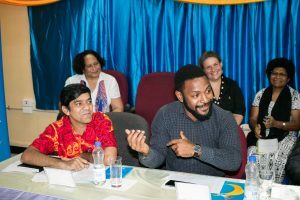 Methuselah Wabiria, third year economics student at UPNG’s School of Business and Public Policy, told the delegation how important the Precinct partnership with ANU has been for his academic development. “ANU is the number one university in Australia and I consider myself lucky to be taught quantitative economics and critical thinking skills by these lecturers,” Mr Wabiria said. “I know how much that can influence policy and how much my country can benefit from an economist who understands the statistics.